The company is reacting to vocal opposition from politicians and activists. Amazon is re-considering its decision to split its second headquarters between New York and Virginia after mounting local opposition in New York City, according to a report. The behemoth retailer "is reconsidering its plan to bring 25,000 jobs to a new campus in New York City following a wave of opposition from local politicians," according to a story in The Washington Post published on Thursday. The Post, which is owned by Amazon founder and CEO Jeff Bezos, cited two people "familiar with the company's thinking." 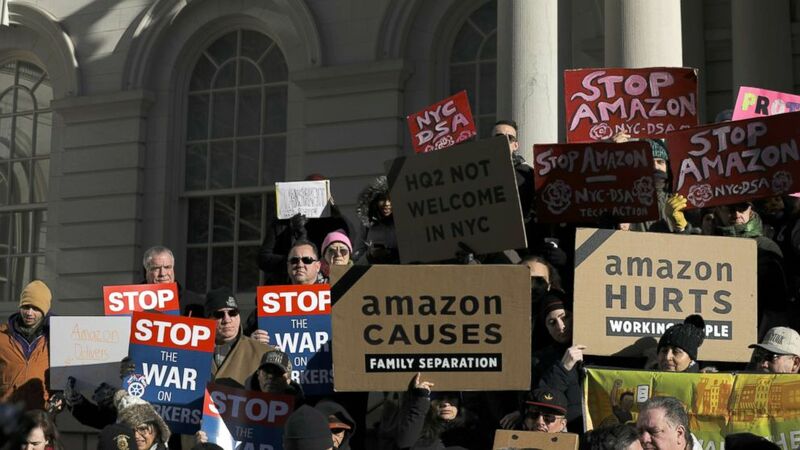 (Drew Angerer/Getty Images) Protestors rally against Amazon and the company's plans to move their second headquarters to the Long Island City neighborhood of Queens, at New York City Hall, Jan. 30, 2019. The Post story stated that Amazon "has not leased or purchased office space for the project, making it easy to withdraw its commitment. Unlike in Virginia — where elected leaders quickly passed an incentive package for a separate headquarters facility — final approval from New York state is not expected until 2020." Amazon issued an emailed statement through a spokeswoman, but did not deny Post's story. “We’re focused on engaging with our new neighbors — small business owners, educators and community leaders. Whether it’s building a pipeline of local jobs through workforce training or funding computer science classes for thousands of New York City students, we are working hard to demonstrate what kind of neighbor we will be." In November, the company had announced it would build two separate second headquarters: one in the Queens neighborhood of Long Island City and the other in Chrystal City, Virginia. The two cities were the winners of a national competition that pitted American cities against each other to woo the retailer and its promise of thousands of high-paying jobs. But almost as soon as the company made the announcement, vocal politicians on the New York City Council and the New York state legislature, as well as residents and unions, voiced opposition to the plans to offer $3 billion in incentives to one of the world's largest companies owned by the world's richest man. New York Governor Andrew Cuomo and New York City Mayor Bill de Blasio both praised the Amazon deal as a great prize for the local economy. Responding to the report of Amazon's second thoughts, de Blasio's office said in a statement, "The Mayor fully expects Amazon to deliver on its promise to New Yorkers." The governor defended the deal, while shifting the blame on intra-New York politics. "The problem is the state Senate has adopted that position and that is what could stop Amazon. And if they do, I would not want to be a democratic senator coming back to my district to explain why Amazon left because I pandered to their politics. It would be a tremendous loss. It is the largest economic development transaction in the history of the state of New York," Cuomo said at an economic development address in Woodbury, Long Island, on Thursday. Newly elected U.S. Rep. Alexandria Ocasio-Cortez, New York state Senator Michael Gianaris of Queens and City Councilman Jimmy Van Bramer have been leading the calls against Amazon. ABC News' Danielle Leigh contributed to this report.